MDOEs are pairs of diffractive optical elements which can act as tunable Fresnel lenses, axicons or other optical elements upon mutual rotation. 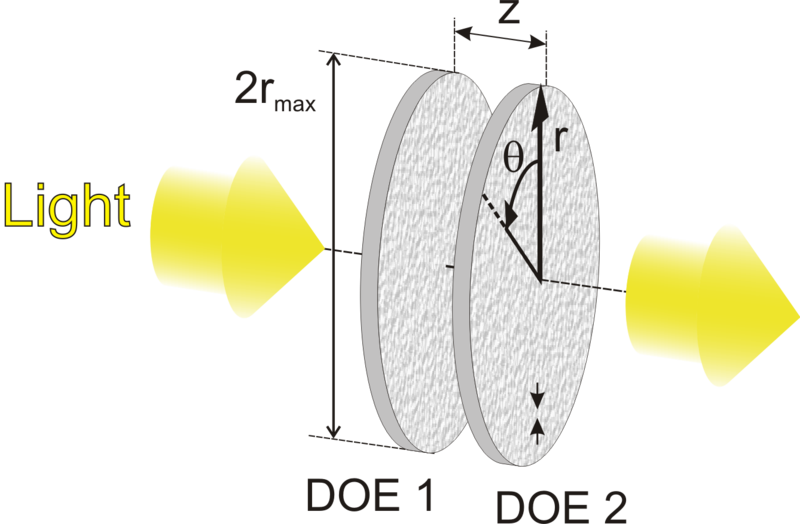 Two specially designed diffractive optical elements (DOEs) are placed very closely behind each other. A rotation of one element around the central axis leads to a Moiré pattern which determines the optical properties of the joint DOE. spiral phase plates with a variable helical index (for holographic optical tweezers to produce doughnut beams or for spiral phase contrast in optical microscopy). as multi-purpose lenses for experimental setups in research laboratories, optical development, and prototyping. dispersion of diffractive element may counteract dispersion of refractive elements (e.g. when combined with a plano-convex lens). Stefan Bernet and Monika Ritsch-Marte, "Multi-color operation of tunable diffractive lenses," Opt. Express 25, 2469-2480 (2017). Walter Harm, Stefan Bernet, Monika Ritsch-Marte, Irina Harder, and Norbert Lindlein, Adjustable diffractive spiral phase plates, Opt. Express 23, 413-421 (2015). Walter Harm, Clemens Roider, Alexander Jesacher, Stefan Bernet, and Monika Ritsch-Marte, "Dispersion tuning with a varifocal diffractive-refractive hybrid lens," Opt. Express 22, 5260-5269 (2014).